Skiing in the Alps, snorkeling the Great Barrier Reef off the coast of Australia, strolling through the streets of Rome and Paris, riding the waves in Hawaii—these are travels I only dreamed about in my younger years. Yet as an adult, I’ve been blessed with these very opportunities. Our children have traveled to Greece, Poland, the Czech Republic, and other locations in Europe for missions, youth retreats, and sports tournaments. A little closer to home in the U.S., we’ve ridden on a fan boat in the Everglades, shoveled feet of snow in North Dakota, and strolled through the coolness of the giant redwood forests. As I write this, I am watching a ship come into the Pearl Harbor channel behind my house here in Hawaii. Unbelievable blessings! All of these experiences have been a result of the 10 military assignments my husband Steve has had in his years in the United States Air Force. But our life as a military homeschooling family is about more than travel and living overseas. There are also challenges that go along with this lifestyle. Numerous deployments and frequent moves are expected of many military families these days, including ours. Steve recently returned from a year in Afghanistan—his third Middle East deployment since 9/11. The “operations tempo” of the air force is completely different from what it was when we were married 22 years ago, and we have learned to adjust. What seems normal now would have been incomprehensible to us a few years ago. 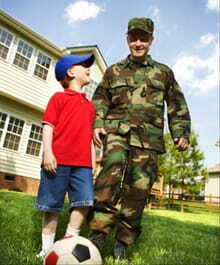 Homeschooling and military life are a logical fit, practically speaking. One study suggests that military families homeschool at the rate of twice the national average.1 My own observations have borne that out. Not only do there seem to be more at-home mothers in the military than in the civilian world, but homeschooling is a fairly common lifestyle among military families. We get few raised eyebrows among our peers when they hear that we homeschool and always have. Our homeschooling journey began in 1995. Our oldest son is now in his first year of college, and our younger three children are still at home. Many of the reasons we began homeschooling sixteen years ago—the opportunity to teach our faith, lack of morals in the public schools, peer pressure—still apply today, but as a military family, other unique reasons and unforeseen blessings have become some of the most influential in our resolve to continue homeschooling. “Honey, I’m going to Afghanistan for a year . . . and I leave in three weeks.” These words were spoken to me by my husband in July, 2009. We’d been through several deployments before, but never one of this length, and not while our family was already stationed overseas. I realized I would not only be living as a single parent, but that I alone would be responsible to help our oldest son finalize his plans for college. The children and I ended up staying in Germany for that year, to keep the rest of their lives as normal as possible. I could say this was an unusual year for us, and in many ways it was. Yet we have had more years than not interrupted by deployments, moves, and even circumstances like illnesses and surgeries. As a military spouse, I often joke that the only constant in our life is change. As the years have gone by, homeschooling has continued on in the midst of it all. Our kids have not been forced to adjust to new schools in addition to the other changes. When our oldest son graduated, I realized that if he had been enrolled in a conventional school, he’d have attended four different schools during high school alone. We have learned to take our vacations when Steve’s schedule allows it, to be ready to relocate when a new assignment comes, and to be open to whatever Uncle Sam requires. As much as I like things neatly checked off, I attempt to keep our schedule fluid in hopes that it won’t fall apart during the weeks or months that we need to be more flexible. For instance, we were able to take a vacation when Steve came home for his two week mid-deployment break during the middle of the school year. Even when the situation is more normal, the kids can take a break during the school day when Steve is able to come home for lunch just to jump on the trampoline or play a chess game with him. My kids would not have the relationship they do with their father had it not been for the blessing of time afforded by the homeschooling lifestyle. As Christians, we believe that everything that comes to us passes through God’s hand first. Whether that is illness, death, a move, or deployment, we know that God can use the situation for our good. It seems that whenever I am feeling smug and sure of my schedule at the beginning of a school year, some circumstance comes along to upend it! I am not in control. Apparently this is a lesson I’ve needed to learn more than once. I’m not meant to be comfortable in this world, and I am actually grateful that God frequently bumps me out of my comfort zone. Yes, this is a cliché, but clichés usually contain a grain of truth. And this is another lesson I’ve had to revisit. Whether it’s a state (or country!) I never thought about living in, a house I don’t like, difficult neighbors, or some other situation not of my choosing, I try to make the best of it, with the attitude of not simply surviving, but thriving. This is definitely not always easy! With each new place we move, we know that there is a purpose for our family being there, and though it’s not always easy to leave friends behind, we do remind each other that it’s not always about us. Blooming where I’m planted has been one of my most difficult and rewarding life lessons. What a rich tapestry of memories we can look back on now as we consider all the locations God has chosen to “plant” our family! With each new military assignment, we start all over again, finding friends, a church, and fellow homeschoolers. While I find it easier to make friends and approach new people than I did 20 years ago, there is still always a time of loneliness and loss. As much as I appreciate fellow Christians and even my own husband, I have learned the lesson that God alone is my Source and Provider and that I must turn to Him to meet my needs. I wonder if I would know these lessons as well as I do had I not been forced to start over so many times. I am frequently reminded that this earthly home is a temporary one, and not to hold too tightly to people or things. As a military wife and homeschooling mother, I can clearly see God’s hand through the past years and the lessons He has taught us. Many of the reasons we began homeschooling have evolved into reasons we couldn’t have imagined sixteen years ago. With our oldest child now graduated and moving into the life God has planned for him, I look back over our years as a military homeschooling family, and I can truly say that I have no regrets. Jennifer McDonald is a freelance writer whose work has been featured in various national publications. She’s been a military wife for 22 years and a homeschool mom of 16 years to her four children, and she has one child in college. She enjoys playing the piano, walking, cooking, and reading. Visit her blog at www.afjen.blogspot.com.